First impression of Roatan is a drive through Coxsenhole in a taxi. Kind of sparsely built place although we may not have driven through the downtown area. The traffic was extremely congested for a small place. The roads were not built for the volume of vehicles that now are on the road. It is quite a distance to Westend. The road is lined with buildings, or at least some indication of humanity, the entire way. Traffic is less congested but the driving habits of the road users are a little lax. It seems the lines on the road and the signs are suggestions one might follow if inclined. 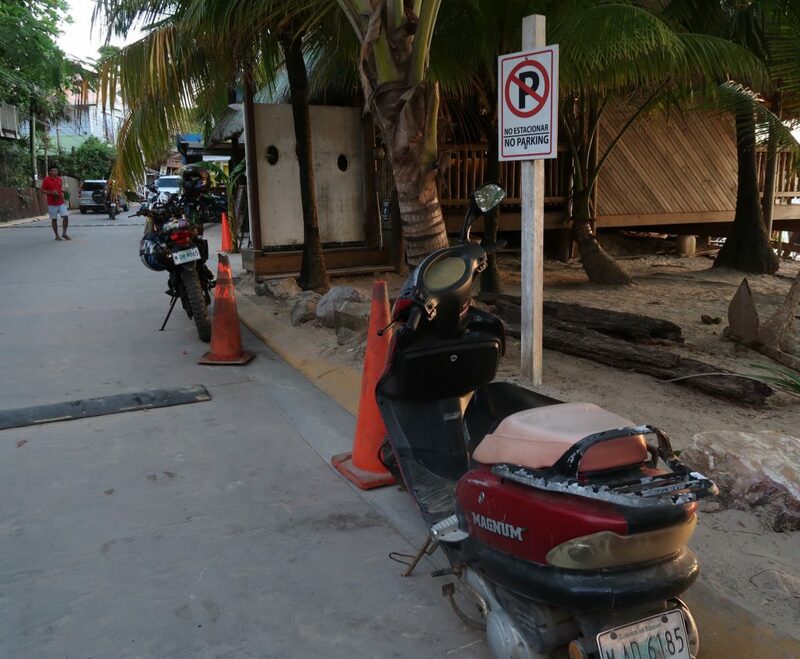 The No Parking Yellow curbs all along the main street are also only a suggestion. Spanish is the official language here but everyone speaks English. I try to remember to speak what Spanish I can but when every one talks to me in English it is hard. It is amazing how much comes back even though my vocabulary is very limited. Cruise ships land here most days. 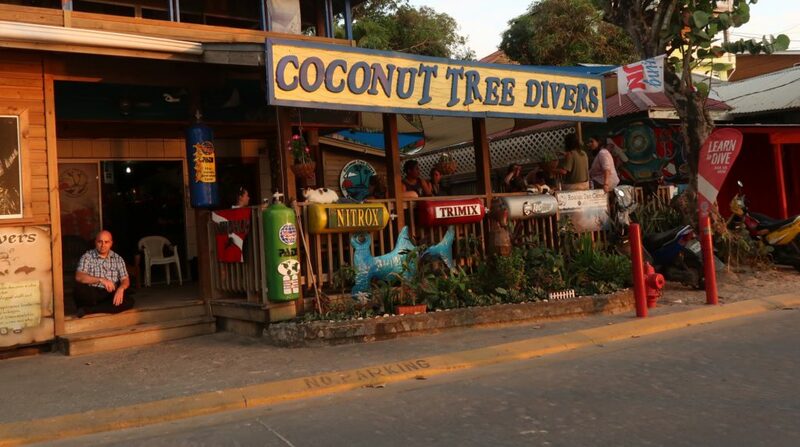 When we come back from our dives at about noon the streets are busy. To the point of being obnoxious. It is not just the number of people, it is the fact they travel in packs. They load and unload the boats en mass, so many they form a line up. The restaurants can be crowded. One we were at was completely reserved and we had to sweet talk the folks letting us stay for lunch. Sunday is the locals day off. The town is busy, the beaches are busy, the bars are busy and the street foodish restaurants are busy. The ‘no parking’ curbs are lined with cars and everybody is squealing. The main composition of downtown is restaurants. About 1/3 of the commercial space on street that line the water is occupied by restaurants. Street food, to fancy tourist type establishments. We have worked both ends of the spectrum and the food is so far very good and we are under budget. The next 1/3 of the businesses are dive shops. 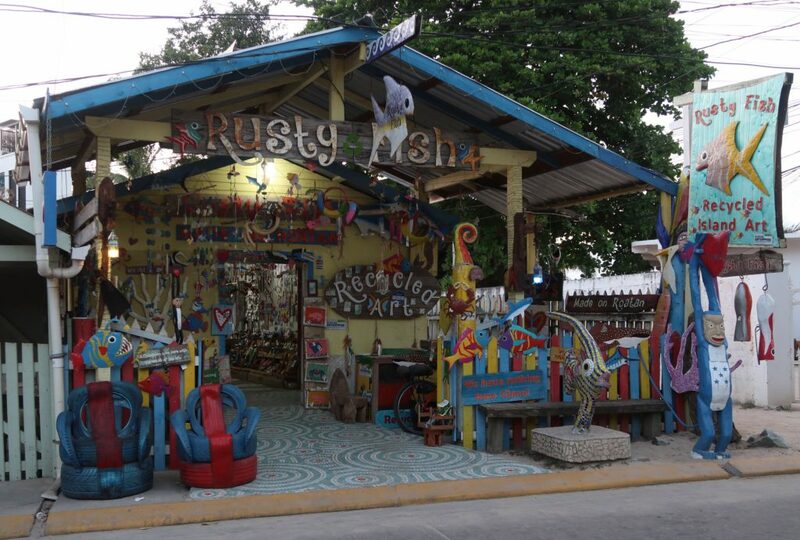 Roatan is a well known dive destination and the shops all seem to be busy. 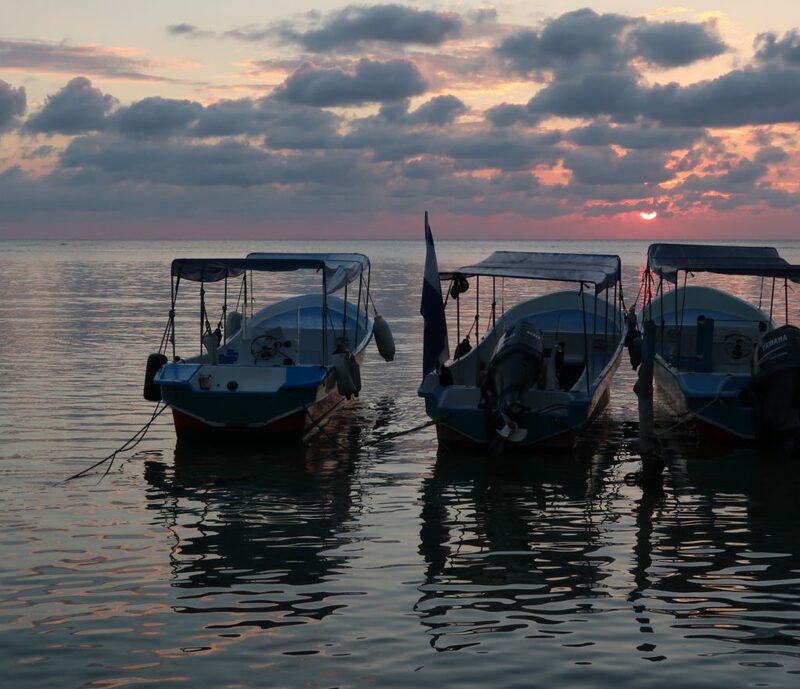 When we are out on the boat and look down the edge of the reef there are boats at almost all of the dive sites. The streets are not strewn with garbage. The vacant lots are not inundated with trash. I don’t know if they have street cleaners or people are just aware. There are lots of trash cans so that helps for sure. Someone has figured it out and it has filtered through the population. The bar scene seems to hopping. By the time we head home from dinner the music is pounding out of the bars and clubs. The streets are crowded with walkers and cars. The noise level is definitely ramped. I don’t know how late it goes but I am glad our hotel is off the beaten track and not near the evening hub bub. The noise shuts down at our local bar at about 9 and that suits us very well. The people here are super. Very friendly, polite, almost to the point of shy. There was fellow walking beside his two kids while they rode their bikes. I asked him where his bike was, that question was enough for him to stop, shake my hand and have a three or four minute conversation. Every person to whom I say hola to answers with a smile. This place, Westend, is a comfortable town. If I come back to Roatan it will be because I like the place.